With high waves hitting southern Bali since Tuesday, several popular Bali beaches have been temporarily closed. 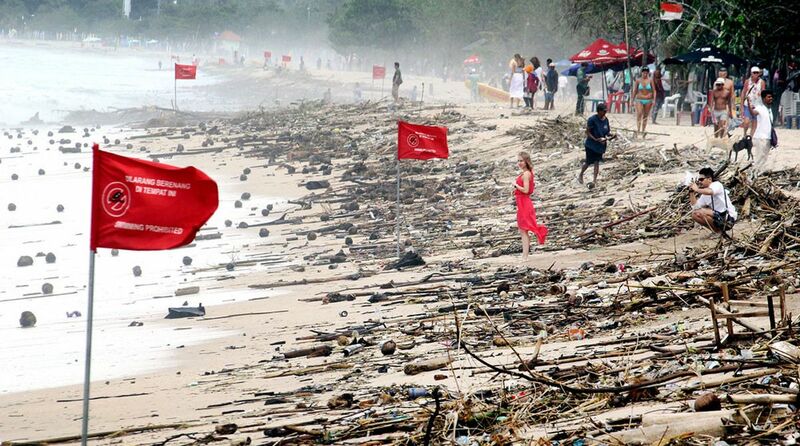 Red flags dot the beaches warning visitors about the safety risks, and tourists visiting Bali have been told not to enter the waters for swimming or surfing. Quoting Badung lifeguard coordinator Ketut Ipel, a report in The Jakarta Post said 5 kilometers of coastline covering Kuta, Legian, Seminyak and Petitenget had been closed to visitors. “We have closed the beaches for all water activities since Tuesday morning because of bad weather and will reopen the beaches after the weather returns to normal,” he said. With the high tidal waves hitting these beaches, piles of trash and driftwood have washed ashore. “Visitors are prohibited to surf because they may be hit by pieces of wood or bamboo. It could be dangerous,” Ipel told The Jakarta Post. The Meteorology, Climatology and Geophysics Agency of Indonesia has issued warning for marine tourism players and fishermen to remain vigilant during the spell of bad weather. Weather reports predict thundershowers over the next many days. “We should anticipate torrential rain, strong winds and high waves. We forecast potential high waves reaching two meters in southern Bali,” The Jakarta Post quoted a senior BMKG official as saying.